Wow — what a view! This image, released today, is a high-resolution shot of the Curiosity rover’s ultimate goal: the stratified flanks of Gale Crater’s 3.4-mile (5.5-km) high central peak, Mount Sharp. 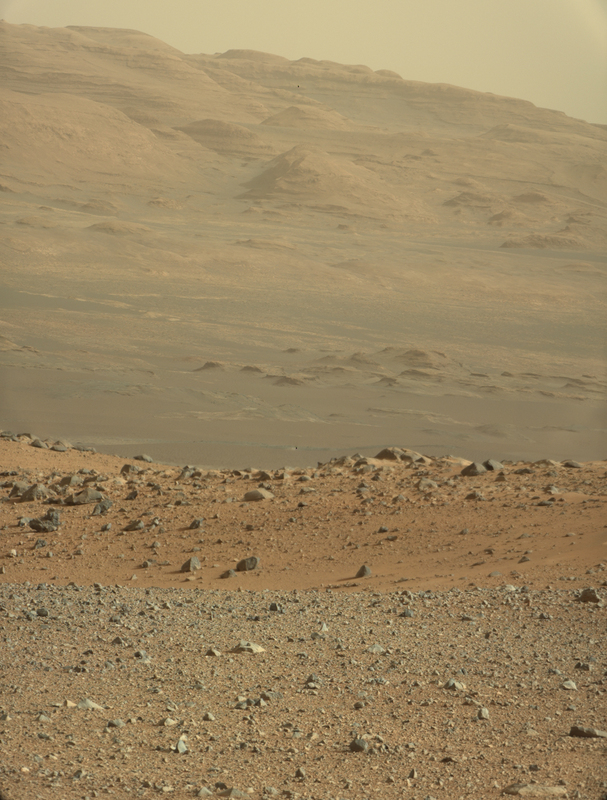 The image was taken with Curiosity’s 100mm telephoto Mastcam as a calibration test… if views like this are what we can expect from the MSL mission, all I can say is (and I’ve said it before) GO CURIOSITY! The gravel-strewn region in the foreground is Curiosity’s immediate landing area. Then the ground dips into a low depression called a swale, then rises up again to the edge of a crater that’s rimmed with larger rocks. Quite a bit beyond that (about 2.2 miles/3.7 km away) are fields of dunes composed of darker material, and then the hummocky base of Mount Sharp itself begins to rise up about 3.4 miles (5.5 km) in the distance. The topmost ridges of Mount Sharp visible above are actually 10 miles (16.2 km) away. The rocky mound just behind the boulder in that image is itself about 1,000 feet (300 meters) across and 300 feet (100 meters) high. Gale Crater isn’t a place for a faint-hearted rover! The colors have been modified from the original image in order to help better discern landforms and differences in surface materials. Here, the images look more like what we’d see under natural Earthly lighting. Curiosity already is returning more data from the Martian surface than have all of NASA’s earlier rovers combined. See more images from Curiosity here, and keep up to date on the mission at the MSL website here. Dammit NASA! Can you stop releasing such awesome images!? I keep having to change my phones wallpaper!!! Well, I’m not going that way. It’s much too rocky. This way is much easier. One can expect from a newspaper summer news to use the non-cannon “Mount Sharp” instead of the official “Aeolis Mons”; but from UniverseToday?? No i didn’t expect it, It’s quite a shame. The really interesting (as in old and likely organics laden sediments) should be the clay layers at the bottom. I wonder if those are the ones that show up as a smooth dichotomy below the layered sediments? And the layered sediments would be after the lake period then, perhaps the recently predicted windblown dust with chaotic snowmelt periods. Well, in a year or two we should know! Imaging like just makes every cent of the $2bn, every sleepless night, every stomach ulcer worth it. NASA: You’ve done a magnificent job!! Wondering why they havent programmed anything to read the air contents of the atmosphere to find out if oxygen is even present. That might be things needed to know if life is sustainable on mars. MSL has an atmospheric sampler; they just recently cleared the remaining Earth air out of it. Not all organisms are oxygen dependent here on Earth… These are called anaerobic bacteria and organisms. Key would be to find carbon as even anaerobic life uses that! Methane is CH4 = one carbon and four hydrogen molecules. That’s why finding methane on Mars is so exciting! The amount of free oxygen was observed by the Vikings, and it is minute. The unshielded UV irradiation and the N2/CO2 atmosphere (and I would guess the CO2 and H2O ices at the poles) creates sundry oxidants, and the overall action creates free oxygen. lcrowell claims ~ 0.13 % below. Determine the role that loss of volatiles to space from the Mars atmosphere has played through time. Determine the current state of the upper atmosphere, ionosphere, and interactions with the solar wind. Determine the current rates of escape of neutral gases and ions to space and the processes controlling them. Determine the ratios of stable isotopes in the Martian atmosphere. The isotope ratios are informing on atmosphere loss rates (lighter atoms escapes faster, so heavier atoms increases relatively seen) but also on any biosphere processes that affects the atmosphere (lighter atoms are metabolized faster, so heavier atoms decreases relatively seen). Note that the observations of methane on Mars are contested, and by no means need either life or a geothermally active planet to occur. If there is methane and it is the amount predicted by the more consistent observations, it can be produced by meteorite impacts and/or serpentinization (chemical production from water action on certain minerals). The biosphere, if there is any, is expected to be anaerobes of the kind that lived on Earth for the first half of the biosphere lifetime until the atmosphere got oxygenated ~ 2.2 billion years ago. Atmosphere oxygenation is a process that takes a really long time. A planet starts out in a state of a reduced atmosphere, i.e. it has a lot of hydrogen, an excess originating from the protoplanetary disk, that can neutralize any free oxygen. That hydrogen excess will have to leach out into space, which can take 0.5 – 1 billion years. It is helped along by UV photolysis, that tear H2O asunder in the upper atmosphere. To usher in an oxygen atmosphere instead of a neutral CO2 dominated one you then need sources of free oxygen. * The already mentioned surface UV irradiation, which will be substantial as long as there is no ozone shield from an oxygen atmosphere, is one. Another one is oxygenating photosynthesis. But in order to have that, you need surface life that can be shielded from UV breakdown yet utilize light. A sufficiently deep ocean is the ticket, it rapidly stops UV but leaves some light for microbial life to take advantage of. Those conditions were gone on Mars before the atmosphere could turn oxygenated, it lost any seas after ~ 1 billion years. And since that didn’t happen, it is unlikely that any life has been forced to evolve to utilize the little free oxygen there is. Oxygen is a powerful oxidant, and highly poisonous for anaerobic life. * On Earth, as opposed to Venus and Mars, the CO2 has been lost from the atmosphere by being quite rapidly scavenged into minerals by the action of plate tectonics. (It probably took less than 0.5 billion years.) Otherwise we would have a CO2/N2/O2 atmosphere. Ironically people are worried by atmosphere loss to space, but it is atmosphere loss to minerals which is the typically dominating process on planets with plate tectonics. anyone notice the black dot? This image is more like what I want to see. Look at all of that sedimentary geo-history! Now it is time to “backpack” a mountain peak with a robot on another planet. Rather amazing when you think about it. I presume the exact course up this mountain has been plotted from HiRISE data. It looks as if there are lots of rover killing traps on this mountain. Is it going to climb Mt. Sharp? I read it is 18,000 feet high. Actually no, as far as I’ve heard during JPL and NASA tech briefs, Curiosity will only climb into the foothills surrounding the mountain. There are some who would like Curiosity to TRY to reach the summit, but that’s probably not in the ‘cards’. Too many pitfalls and steep terrain? I’d rather they didn’t try, instead focusing on a long life! Be a great view though! I climbed Mt. Whitney once @ 14,505 feet up.. THAT was a great view! The impact that created this crater and the reflexive rebound of materials that created the central peak, or Mt. Sharp, excavated all those enumerable layers. How they were deposited in the first place, prior to the impact, is the real question. I’ll place my bets that they are layers of volcanic ash and regolith deposits from early asteroid and cometary bombardment. Imagining a scenario like that is simply put, mind boggling! by 2030, send up some workmen with hammers and chissels. Its mt Rushmore time. At least when Mars snapshots shows a head, we will know its for real. Deejay – I agree, Thats why i love the original Viking photos – as natural as you can get! but I do also like the contrast corrected photos – makes details easier to see. Holy carp! Wow, so beautiful. I actually think the unaltered photo is even better. Seems so much more alien, as I would expect. Hmmm, it still needs a 15 foot tall, four armed thark…just to the left. If you zoom in you’ll see two black dots anyone knows what it is? Already this proved that there was life on Mars? look at this photo of the same skull. look at this photo of the same skull. does not it? So? they are fakes? a montage from Arizona and elswhere???? ?